Contains stories of awesome by the likes of Lisa L. Hannett, Margo Lanagan, Catherynne Valente, Tanith Lee, Caitlin R. Kiernan, Neil Gaiman, et al. And I got a berth, too. Huzzah! 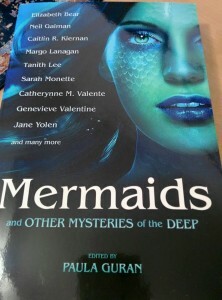 This entry was posted in fairy tales, News and tagged Caitlin R. Kiernan, Catherynne Valente, Genevieve Valentine, Jane Yolen, Lisa L Hannett, margo lanagan, Mermaids and Other Mysteries of the Deep, neil gaiman, Paula Guran, prime books, Tanith Lee. Bookmark the permalink.